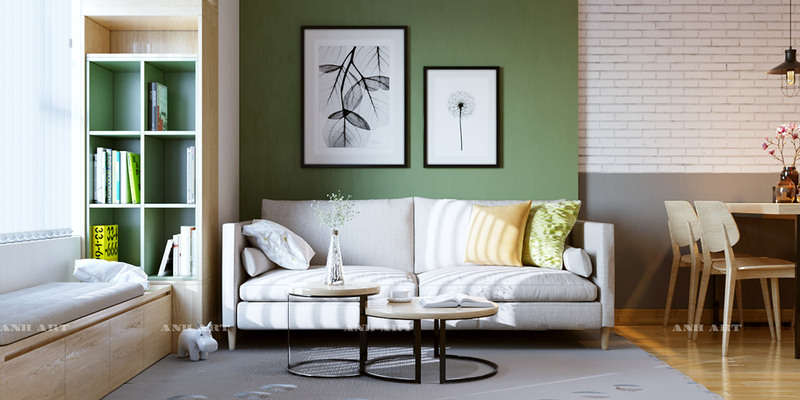 Whether it's a green accent wall or a few seafoam green throw pillows, adding a pop of green has the power to completely transform any living room. 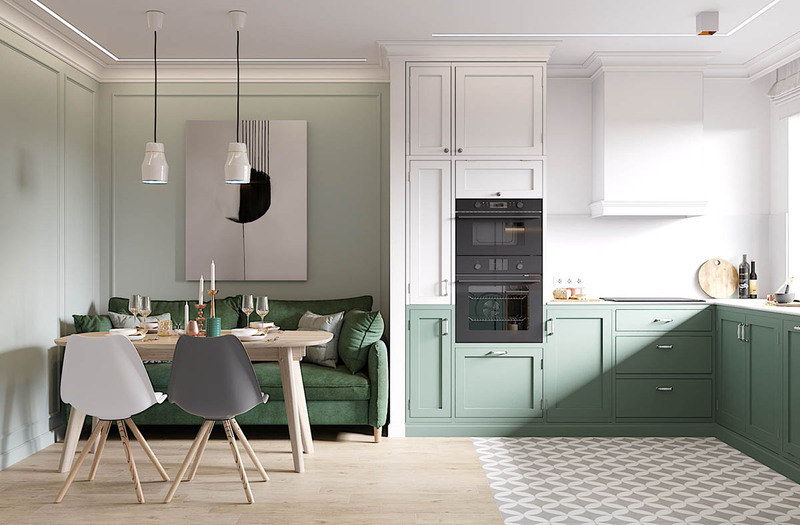 If you want a more dramatic feel, be sure to indulge in colors like dark moss and emerald green. Looking for a little tranquility? 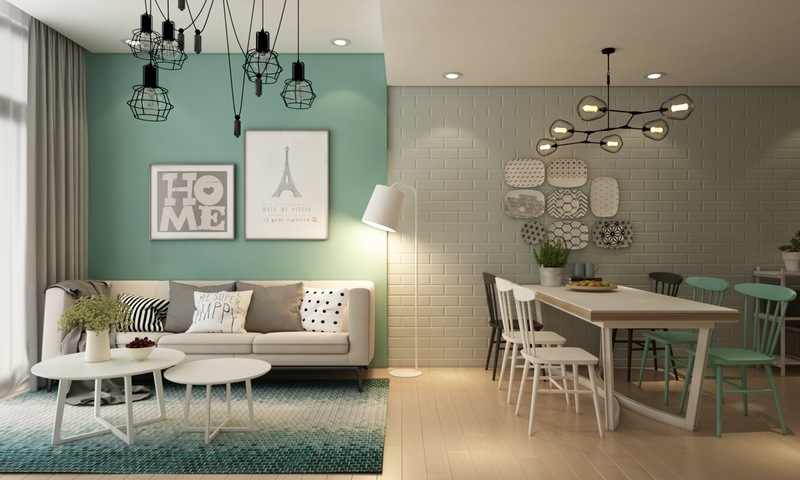 Paint your walls in softer hue like mint. And for those looking to make a big impact, there is always the tried and true lime green. If you're not quite sure which color best suits you, we've got you covered. 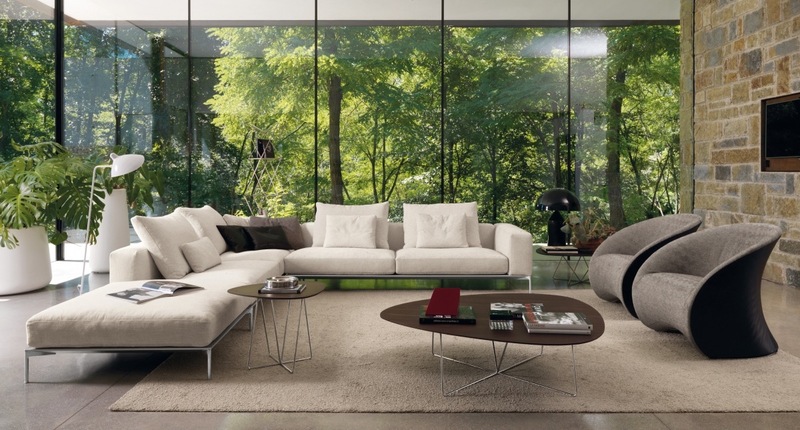 Keep scrolling to see our hand picked collection of the best green living rooms by designers and visualizers around the globe. 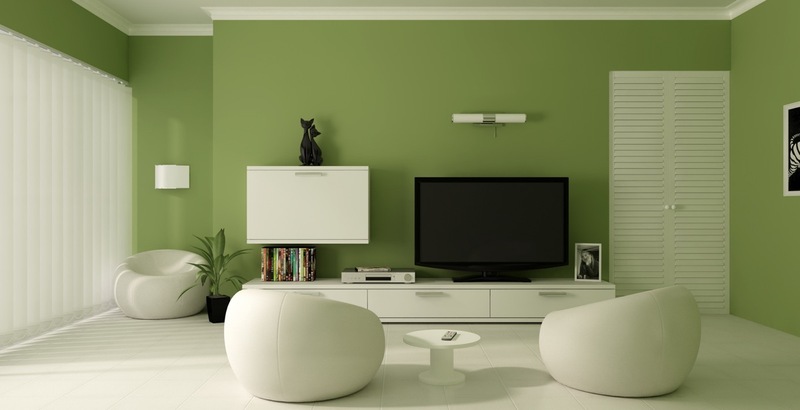 The green walls in this modern living room are beautifully offset by a white entertainment console and accent chairs. 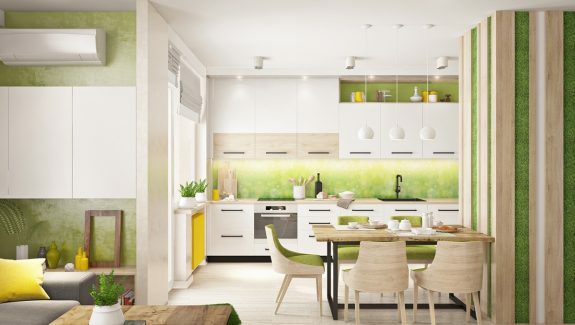 Combining green and white is a great way to obtain a fresh and energizing design aesthetic. We love that cute ottoman coffee table! 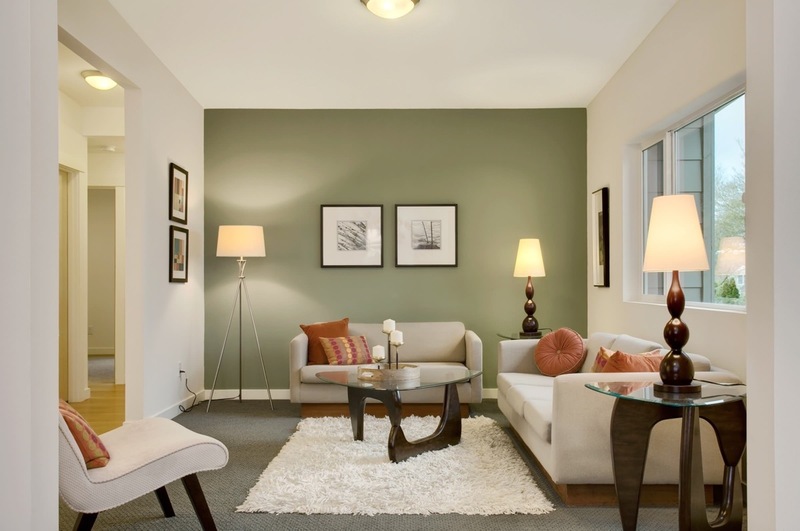 The unusual combo of the dark moss green walls and coral accent couch make this room a contemporary haven. The pink modern sofa not only adds visual interest to this room, but it also ensures that the red accent pillows and rug don’t give a dreaded Christmas feel. 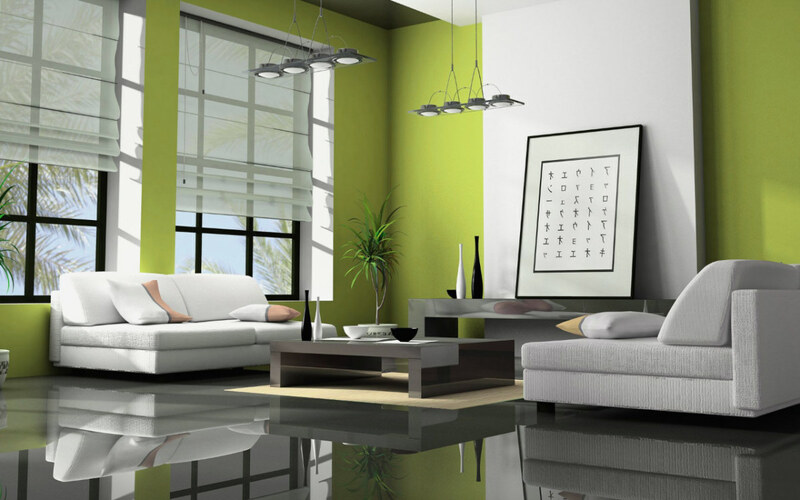 Large windows that allow lots of natural light make sure that this room isn’t overwhelmed by it’s dark green hue. Try pairing rusty orange with a sage green to achieve a similar tribal vibe. Kelly green and wood accent pieces make this room feel fresh, yet rustic. 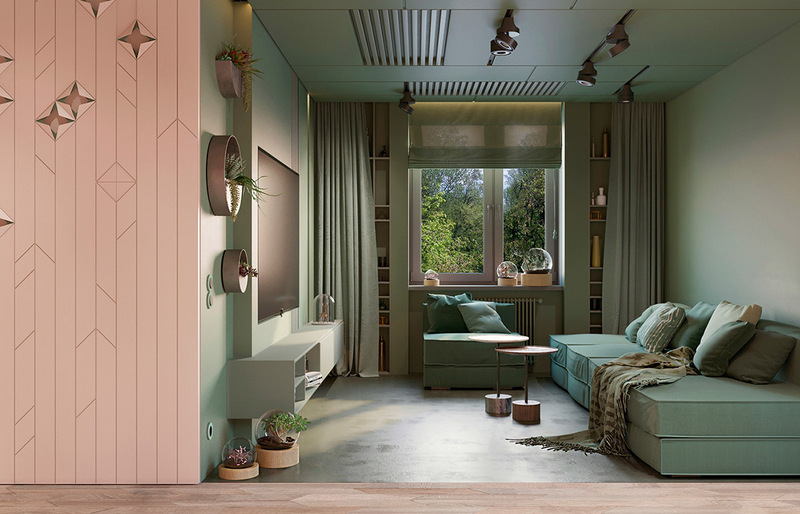 Combining green pieces like the luxurious couch, ottoman coffee table, and wood side console is a great way to bring the feel of nature indoors and the perfect combo to give a living room a fresh aesthetic. A natural feel is highlighted in this living room with the use of nature wall art, large windows and a unique ceiling fan. The addition of orange accent pillows add just the right pop of color to offset the green walls. The oversized accent rug, floor to ceiling art work, and a marble fireplace grant the luxurious feel in this bespoke living room. 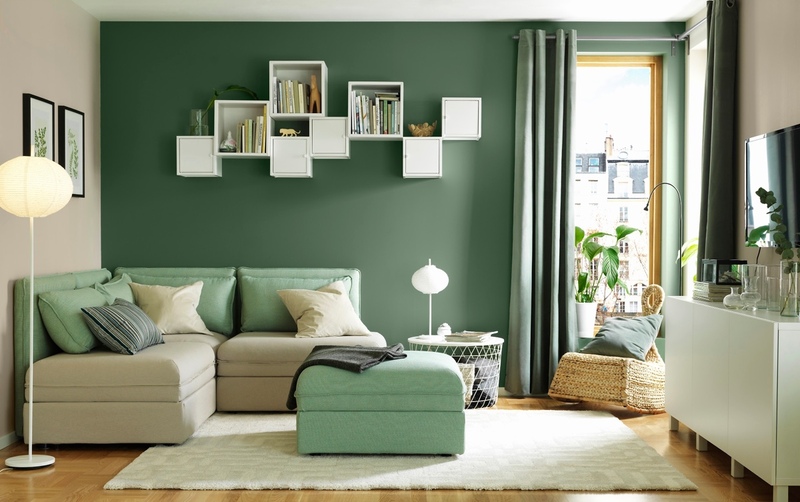 With the olive green walls being the only bold color in this room, it just goes to show that you don’t need a crazy color palette to pull off a good living room design. Orange and green is the perfect combo for those looking to make a statement. Take a note from this living room’s design and add a contrasting hue to the backboard of a bookshelf. It’s a great way to not only highlight wall shelves , but this design technique can also be used to add some color to free standing bookshelves as well. 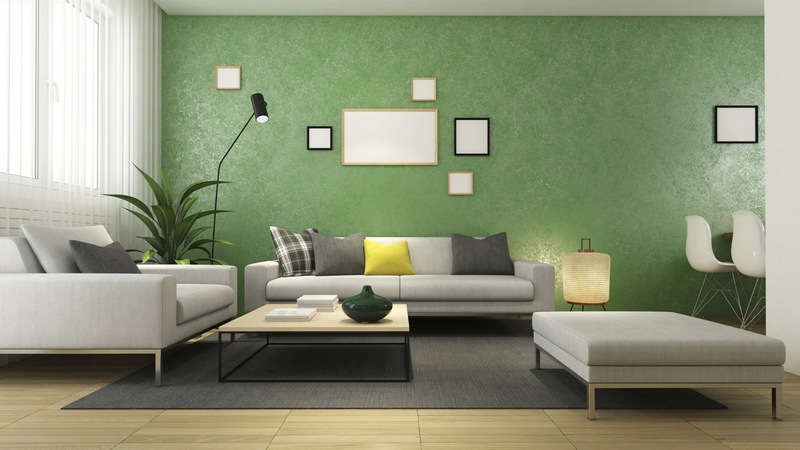 A bold green and gray pairing might just be what your living room needs. Rememeber that little changes in your space can have a big impact. 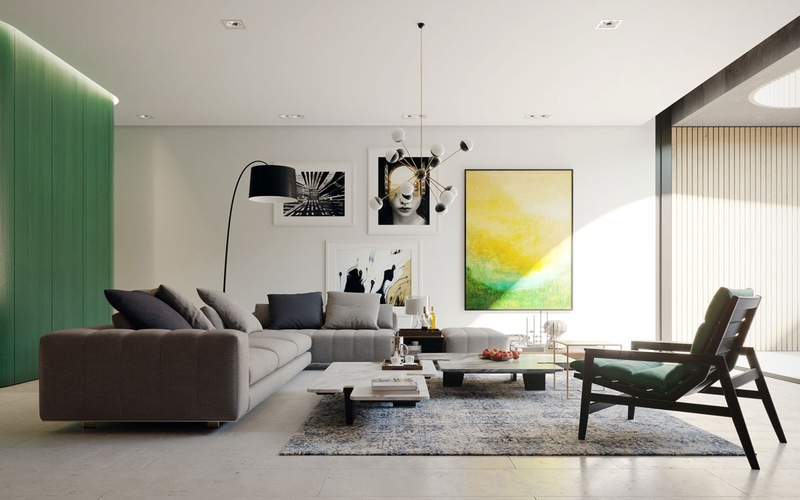 Try a floor lamp to add some softer lighting for a cozier feel or if you want to add a functional statement piece, you could always try a unique coffee table . 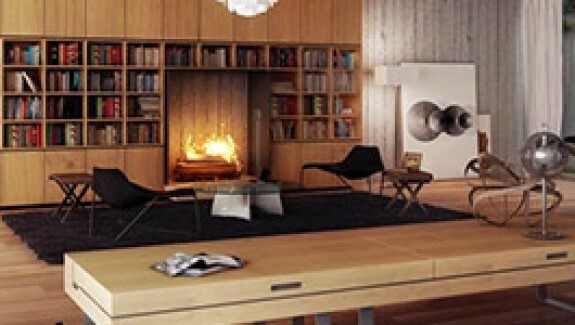 This Asian inspired living room design strikes the perfect balance of tranquility and elegance. 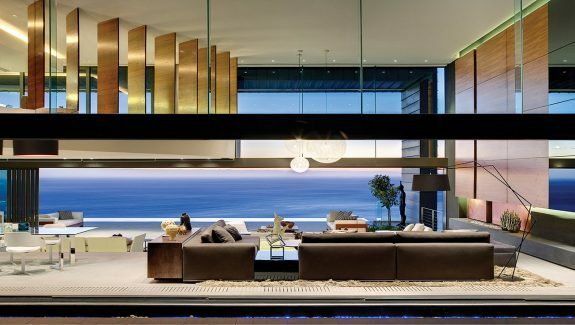 If you love the look, be sure to check out modern asian inspired design for more inspiration and ideas. Proof that small living rooms can be both stylish and functional. 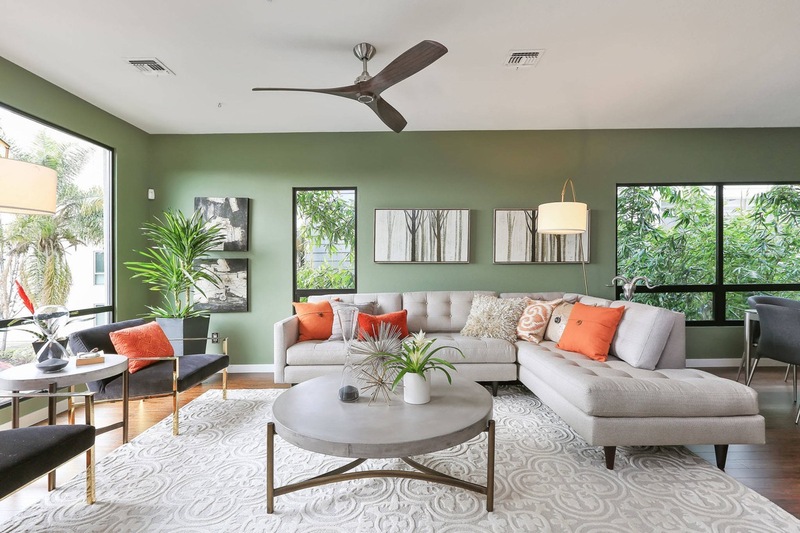 The bright pop of lime green found in the ottomans, throw pillows, and vases throughout this modern living room play amazingly well off of the geometric blue couch cushions and wood accents. 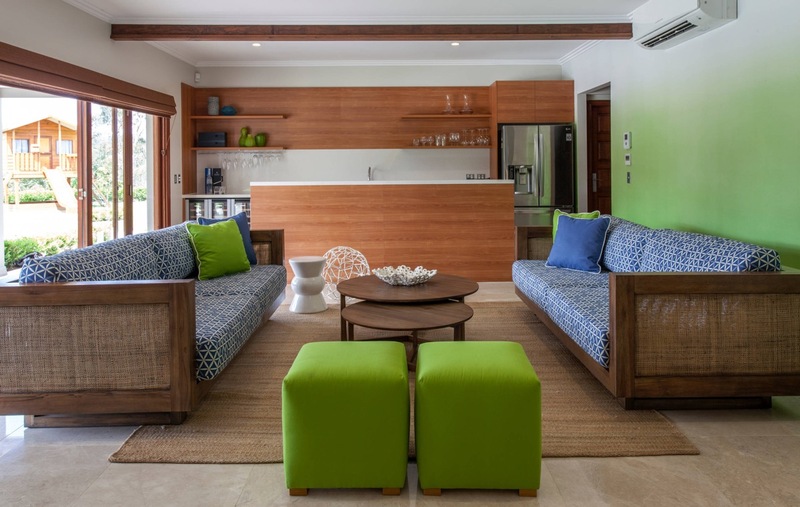 The combo of a bright color paired with wood is a wonderful way to help create an inviting and fun space. A high gloss, textured green accent wall pairs perfectly with the large windows in this contemporary living room. 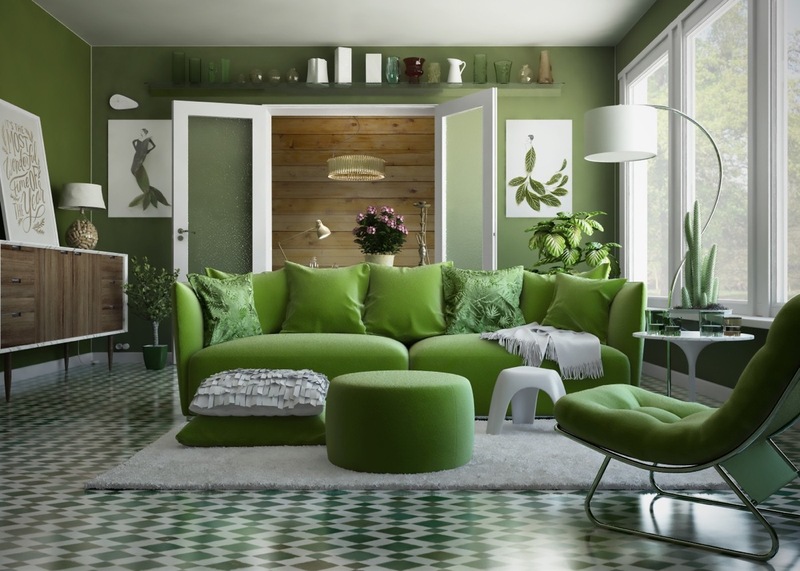 The addition of green makes what would be an otherwise monochromatic room feel vibrant and welcoming. 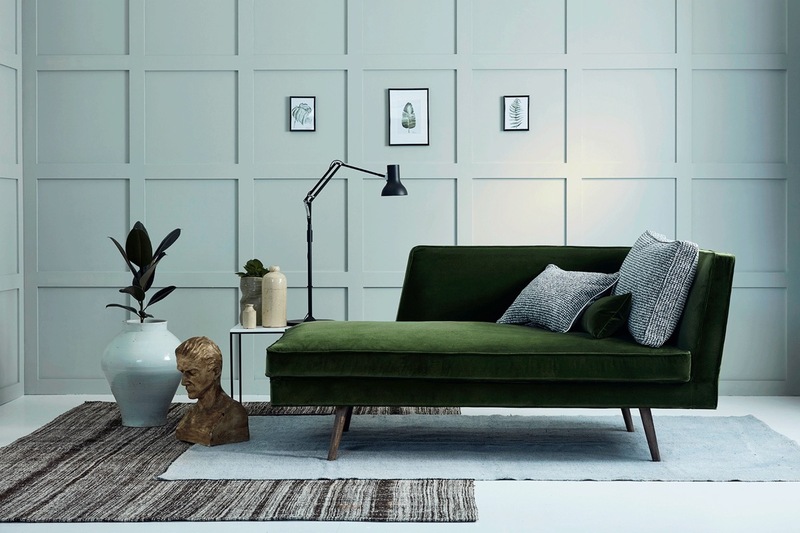 An accent piece like this fabulous chaise longue is a great way to add the luxurious feel of moss green to a room, without getting your hands dirty with paint. This chair is pictured in velvet grass, but it is also available in a multitude of other colors and fabrics. A pink accent wall combines with the adjacent minty hues to create a tranquil vibe in this small living room. To ensure that such a tiny space doesn’t look overly busy, curtains have been used to hide any clutter on bookshelves that might make the room feel overcrowded. 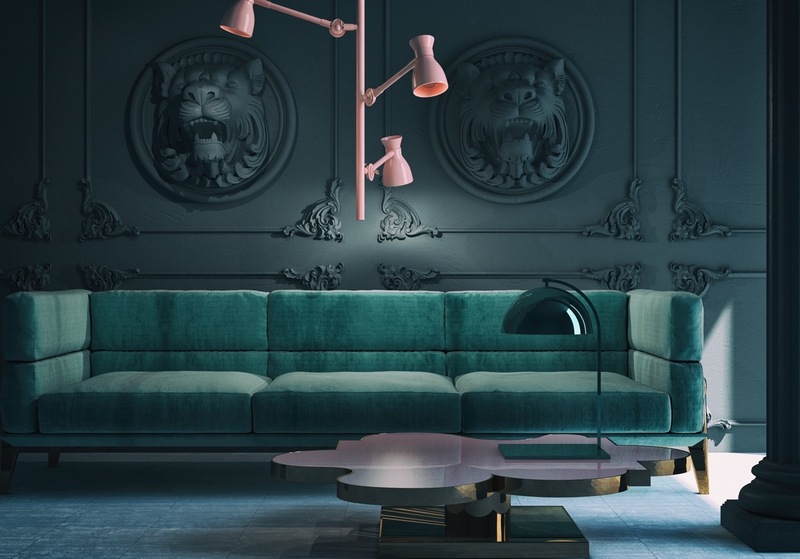 Dark and dramatic, the pink overhead lighting, the dark green couch and a designer table lamp enhance the powerful aesthetic of this living room. Of course, the two lion heads mounted on the wall don’t hurt either. 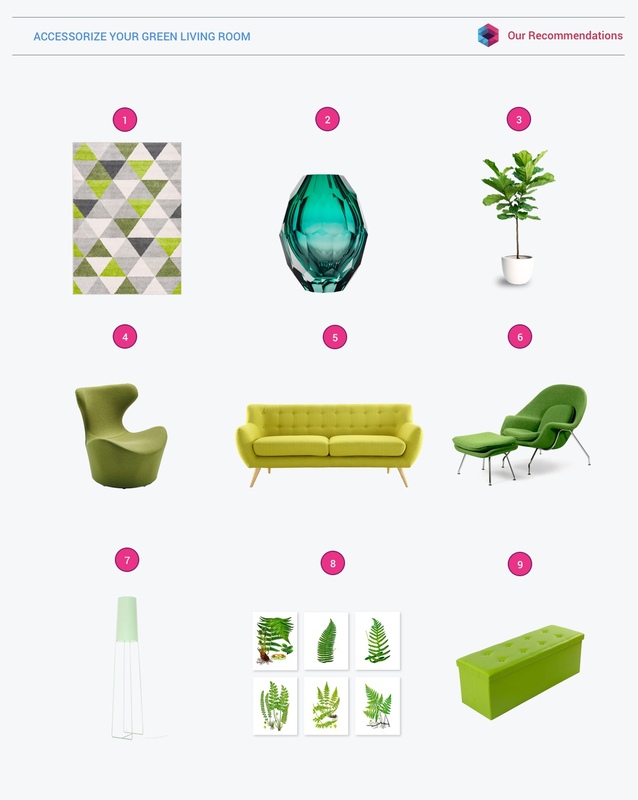 If a mid century living room what you are after, green can play a key factor. 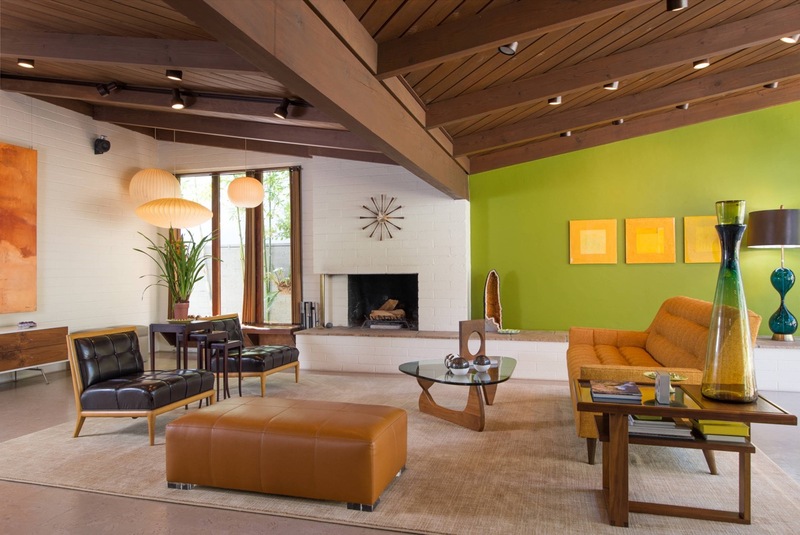 The lime green accent wall in this design is beautifully offset with dark leather accent chairs, a large ottoman, and brown beamed ceilings. One of the pieces we absolutely love in this room is the mid century modern coffee table called the Noguchi table, designed by sculptor Isamu Noguchi. 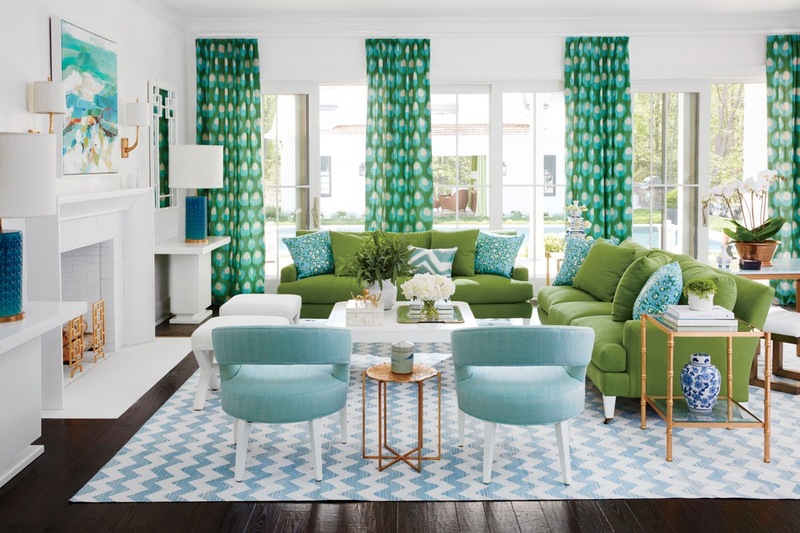 A large chevron rug and bold patterned green curtains make this a fun space for entertaining. There is plenty of seating with the plush green couches, white ottomans and sky blue accent chairs. The off white rug in this living room charmingly contrasts against the medium green wall and mint green couch cushions to create this cozy haven. With the addition of a matching floor and table lamp, it is the perfect place to snuggle up with a blanket and read a book or catch up on your favorite TV shows. White always runs the risk of feeling sterile and impersonal, but not in this living room. 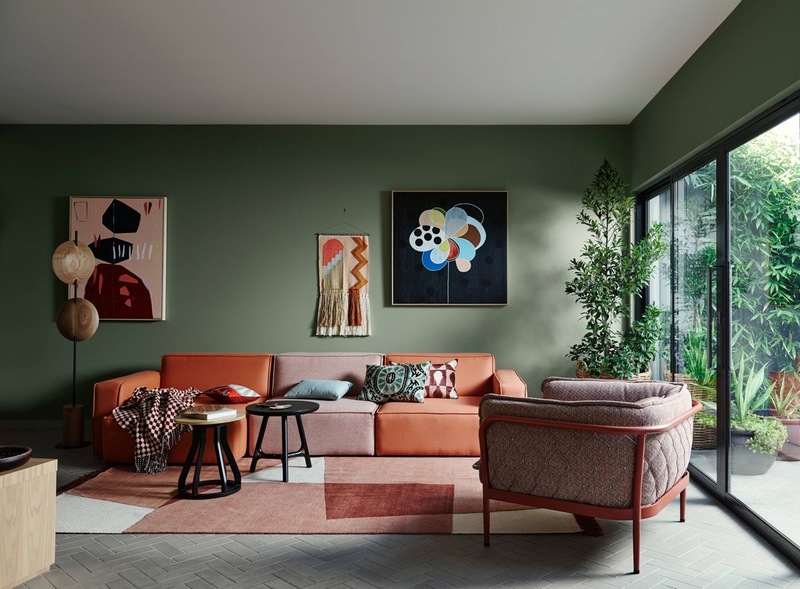 A sage green accent wall, wooden tables, orange throw pillows, and the high pile rug in this room strike the perfect balance of calm and stylish. 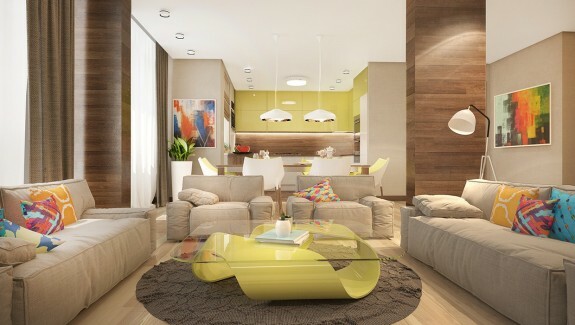 This open-concept living room is simple, yet brimming with style. 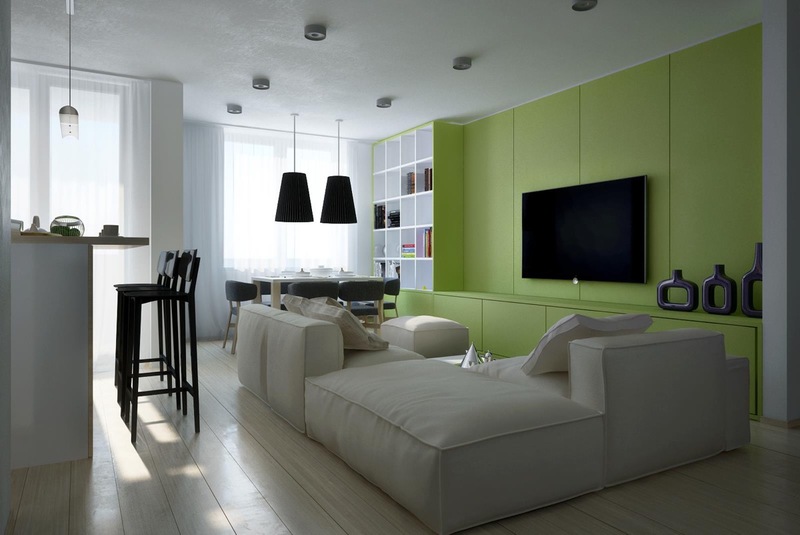 The flat screen TV is highlighted with a green backdrop and built-in cabinets. These cabinets are a great place to stash DVDs, gaming systems, and any other items that might visually clutter the room. By decluttering your living room, you can make room for fun accent pieces like the trio of decorative vases pictured in this design. Flow is essential for good design, especially in open-concept spaces, and color can help you achieve that goal. Here we see the same seafoam green on the living room accent wall be carried to the dining area and displayed on two of the chairs. 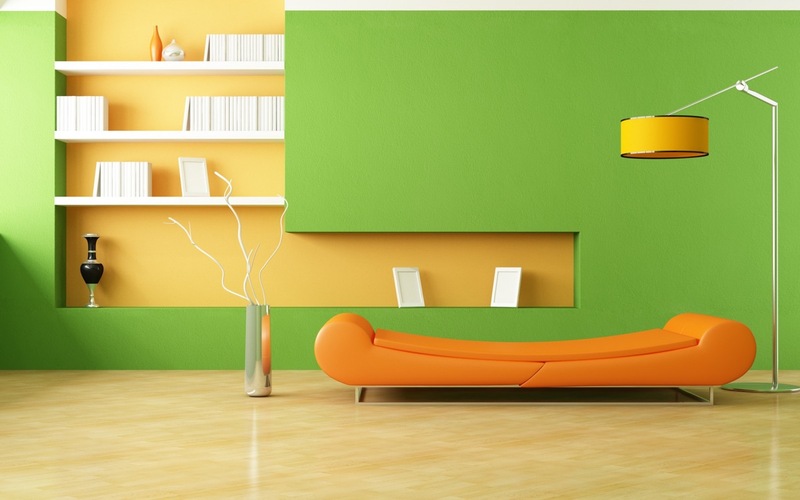 The continuation of color is essential to tie this space together. Note that the a clean, bright white and modern gray have also been used in both rooms. 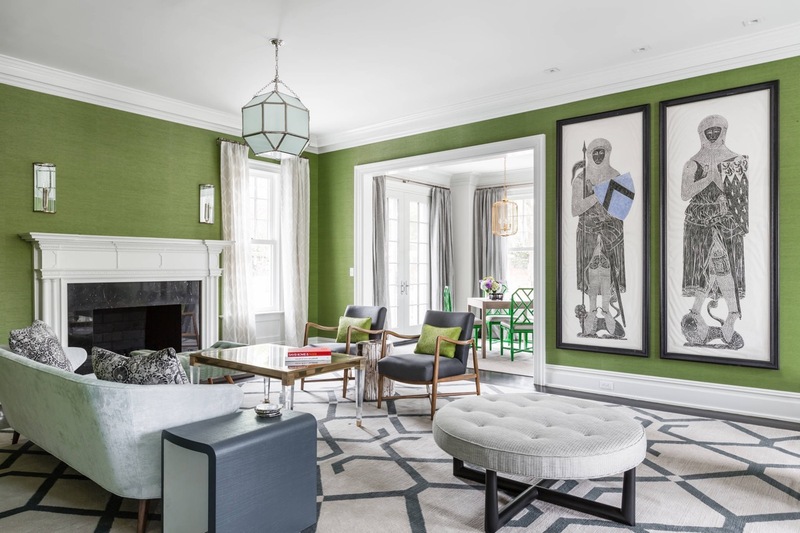 In this living room, green has not only been incorporated through the paint color and accent pillows, but also through the plants on the wall shelves. This long and narrow room benefits from the mirrors above the couch as well. Not only are they stylish, but they help the space look wider. 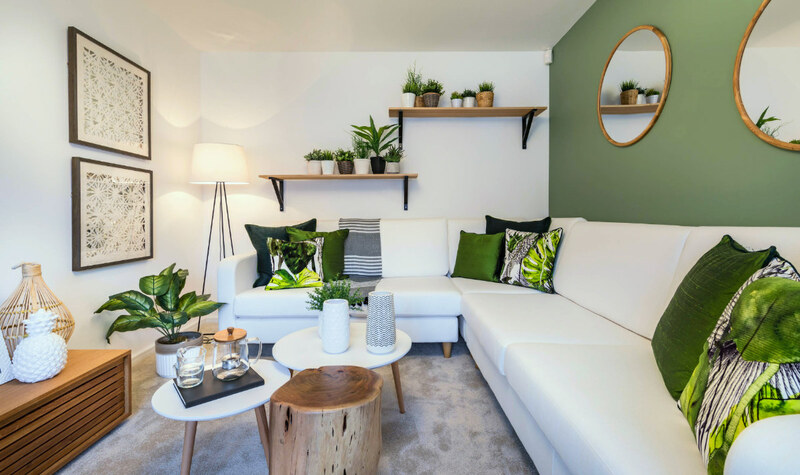 In this living room, the plants not only tie in the green accent chair, but they also soften the look of the concrete wall. Love houseplants, but not sure what you should get? Be sure to checkout the indoor house plant post we featured a while back where we discuss some beautiful, yet easy to maintain plants. 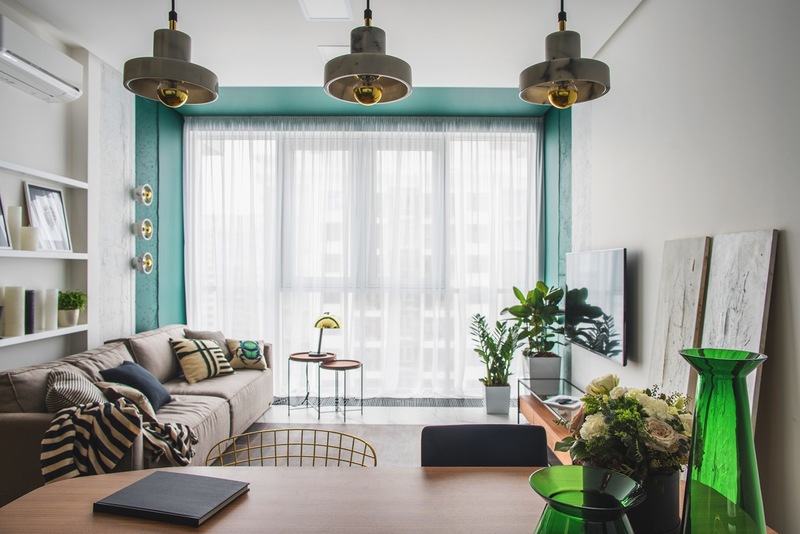 Small, yet stylish and regal, this cozy space greatly benefits from not only the large impact of framing the window in a bold turquoise, but the smaller details as well, like the assortment of throw pillows and green vases. See more photo of this fabulous living room <a href="http://www.home-designing.com/green-and-gold-interior-with-modern-eclectic-vibe-includes-floor-plans" target="
Sleek, stylish, and modern are just a few of the words that came to mind when we saw this amazing living room. When working with such a small space, every detail counts, which is why we adore the green accent wall and matching bookcase, not to mention the gorgeous art prints by Tuan Anh Le. These nature inspired art prints are available here. Also, love the kind of tables you see here? Do check out our post on nesting coffee tables then. This funky living room has a bit of a retro vibe with it’s Sputnik Chandelier, tile floor and low furniture. Bright colors have been thoughtfully utilized in this space with the illuminated green side wall and sunshine yellow artwork. Visualizer, Mario Maleš, knows that you don’t necessarily need to use a lot of color, you just need to use it well. 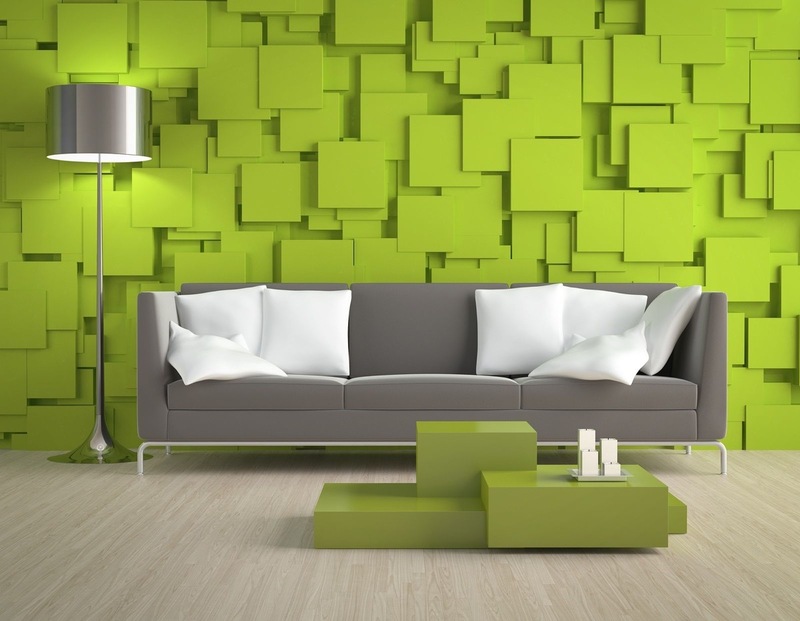 Color blocking an accent wall in your living room can have a big impact. Not only is it modern and stylish, but it can create some much needed contrast. 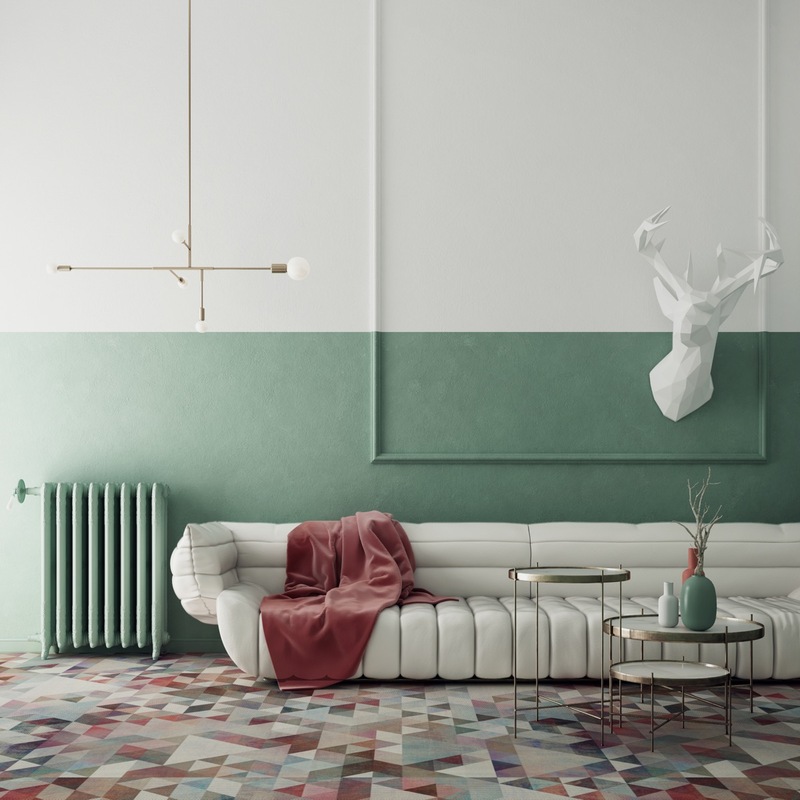 The sage green color on the wall allows the white leather couch to become a statement piece in this room. The similar colored vases and tables that match the modern chandelier are also key to making this design work. 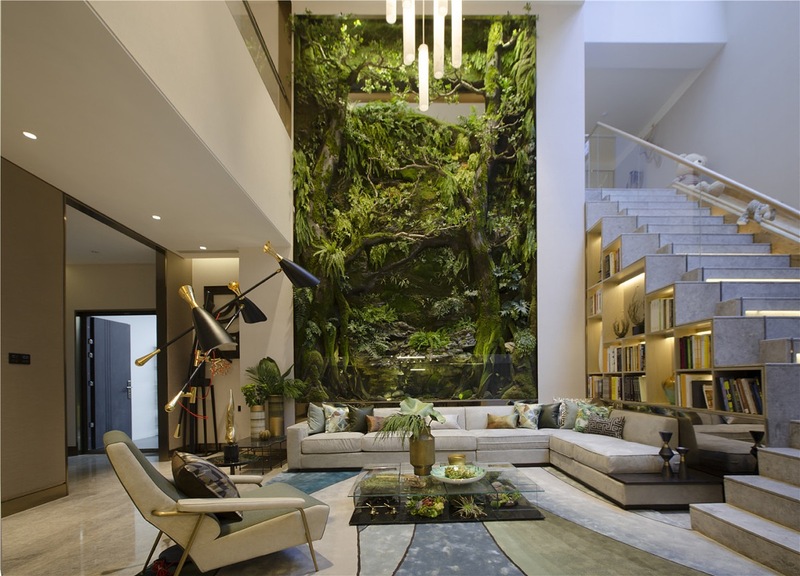 A large wall terrarium draws the eye to the back of this wondrous living room. Although such an extravagant project may not be in your budget, a large nature painting or mural would have a similar effect. 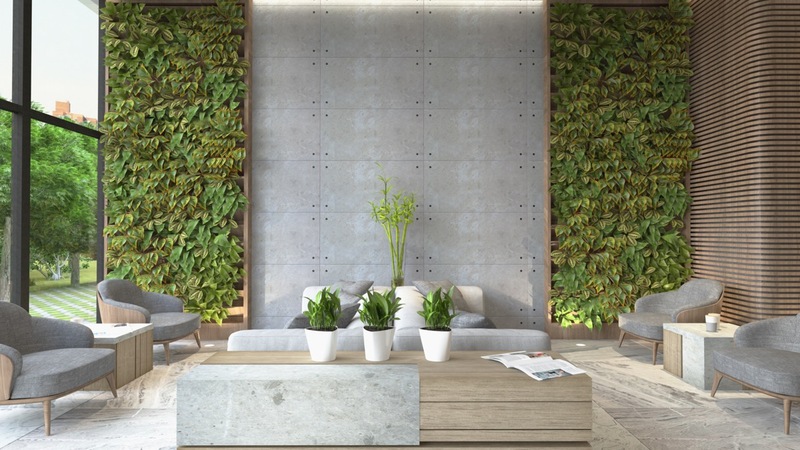 The combination of the concrete accent wall and greenery make this room feel like an urban jungle. Love the idea of a concrete accent wall? Be sure to check out 30 Striking Bedrooms That Use Concrete Finish Artfully for more ideas and inspiration. Not many homes are lucky enough to have a full wall backdrop of greenery, but those who are could try framing it in a similar fashion. To get the look, consider using neutrals and let mother nature add the color for you. 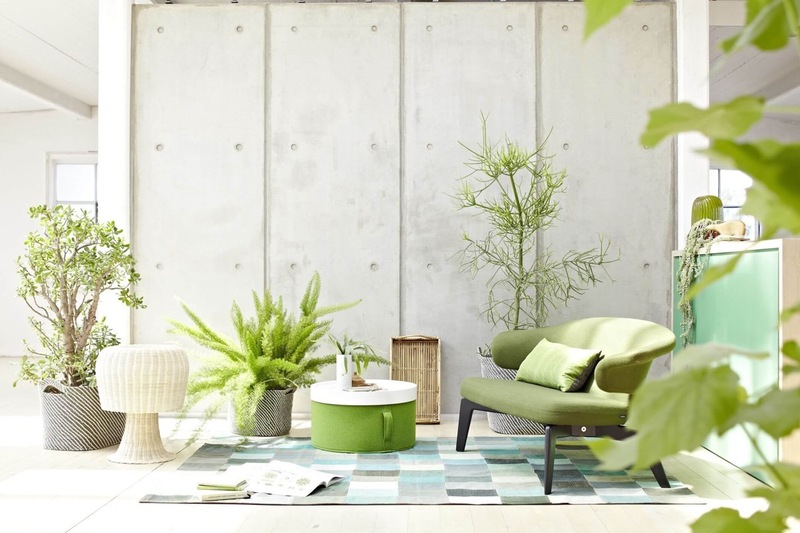 The soft hues combined with the outside greenery give this space a fresh and revitalizing feel.